Last year, she suffered a massive stroke to the left side of her brain. She was paralysed neck down. She could not speak a word. I remember telling her, you have got to fight. This can’t be you because my ma knows how to fight. She did. And she came back full blown. Her motor skills are back. She still has a speech defect but she is not letting it hold her back. 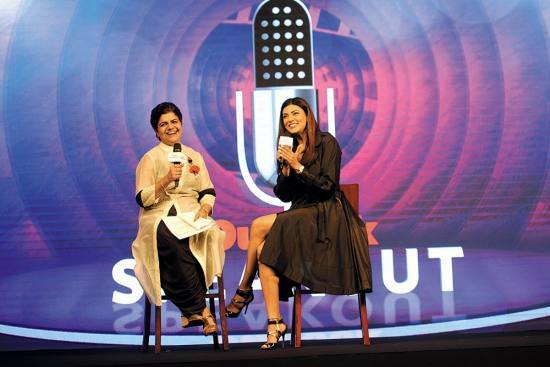 The Outlook Speakout event is the first public appe­arance she made in a long time. The year I competed in the Miss India contest, Aishwarya Rai was a hot favo­urite. Some 25-26 kids refused to enter the pageant because she was competing and everyone believed her to be a sure shot winner, including me, by the way. I was about to turn 18. I came back home and told my ma that I will go next year. She asked me why. I said, “Ma, you know that Pepsi ad girl Aishwarya Rai is entering the contest and it’s a bad idea this year.” My mother first sulked and did not speak to me the entire day. I couldn’t do with my mum not talking to me. So I asked her why she was so upset. Finally, she sat me down and said, “You can’t be my daughter. You cannot be someone, who just gives up without trying. I don’t care, who is competing. If this child (Aishwarya) is the most beautiful thing you have ever seen, that is all the more reason you should participate. Lose to her if you have to. What is this ‘andhon mein kaana raaja’ attitude that you will go when there is no competition? I told her, if it’s that bad, I will sign in. She told me not to do it for her but for myself, or else I will never know if I can be an upset to somebody. “I want my kids to get their basic eduction in India—put the calculator aside and do the math on their fingers. One night before the Miss India event, my mother was flying in from Delhi to Bombay and then Bombay to Goa, where the competition was being held. When she reached Bombay, I called her up crying, and asked her not to come. I told her, I will feel very sad losing in front of you as ‘that girl’ has won every preliminary competition, and she is going to win. I said, if you love me, you will not come. I was still a baby. I was 18 and was freaking out. She agreed to stay back in Bombay. Then I won the Miss India title. My mother was at the airport when I landed in Bombay. I went and touched her feet and said, “I am so sorry, you missed it, ma.” She said, “Because you made me miss this, you will now win Miss Universe so I can watch.” I remember that so distinctly and she watched me become the Miss Universe. A lot of people have spoken in the past about several beauty queens emerging from an armed forces background. I think it is far deeper than what they say it is. It’s about the discipline of patriotism. It comes very strongly from the time that we are born. With defence backgrounds, all of us come to honour this dream to win for our country; to see our flag being hoisted. It’s pretty much like an Olympian, who loves the idea of representing her country. So, whenever we are put in a gruelling situation that expects strict regimentation—which these pageants have been internationally—we can deal with it. You go there for a month but most girls want to run back to their countries in the first 10 days. It is not just about parading in swimsuits. You have to be up by 4.30-5 every morning. You are going to be photographed the entire day, meeting the heads of states. Because of our upbringing, we know how to just dig our heels in. I have seen that about every single army, air force and navy kid I have met; it’s just in their blood. They just know how to do it. I want my daughters to have their own spirit. As generations grow, what is important for a mother to teach her children is very different in today’s times. I believe that my children need to make mistakes but take responsibility for them. I need them to learn that very early in life. I don’t take excus­­es and keep telling them that if you are in charge, and have taken a call, you take the responsibility. They have to think for themselves and make their own mistakes. I grew up studying in Kendriya Vidyalayas wherever my dad was posted. I came to a private kind of set-up with Air Force Golden Jubilee School only after my Class 9th. And I failed my Class 10th English because my education till then was in Hindi medium. Then everyone made it a habit of speaking to me in English at home. Things started changing but I truly picked up the language only after winning the Miss Universe. They taught me British English and the American English, and the difference between the two. However, my foundation in education was solid because of KV. I beli­eve that India gives the best fundamental education. I would want my kids to get their basics here—put the calculator aside and do the math on their fingers. That’s fundamentally getting it right. If Renee wants to go for higher studies in Liberal Arts—this is the field she has picked—and English Literature or Music then she will go abroad. Alisah, all of 9, wants to go to a boarding school, following Renee’s footsteps. She cannot miss out on the fun that ‘didi’ had. I have told her she can go after finishing Class 8, and only if she makes the grade. Ever since I told her, she is getting top grades in all subjects. It’s a great time to be in Bollywood, espec­ially if you are in love with the art of cinema. When people start to watch and enjoy a Stree, you know that people actually love the process of great cinema and different kinds of films. Not just cinema, there are so many different avenues of telling a story now. I watched the web series Sacred Games, and it is incredible. As of now, there are two movies that I have green-lighted. In one, I play a tough UP cop, who is hilarious, and I am very excited about it. Final touches are being given to the script. And Mudassar Aziz is writing anoth­er film for me. It will take the word progressive to another level. I play the most incredible woman of my age, 42, but I promise I am going to make that age look amazing. I don’t want to play a young girl running around trees. And yes, it’s a great time to be back!